The Quranic Concept of War – written in 1989 by a Brigadier General SK Malik of the Pakistani army with the forward by the Army Chief of Staff/former Pakistani President Zia ul Haq and the Preface by the Advocate General of Pakistan – is doctrine for the Pakistani military. It makes clear that war against non-muslim forces is obligatory until Islam dominates the world. 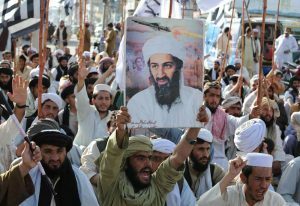 After the 9/11 attacks, the Pakistani Intelligence Service (ISI) aided Al Qaeda in moving men and equipment to safer locations anticipating U.S. retaliatory attacks. Al Qaeda’s leader Osama bin Laden lived in Abbottabad, Pakistan for several years up until the time he was killed in a U.S. raid. Pakistan used “aid” money provided by the United States government during the Obama Administration to expand its nuclear program. Pakistani ISI created Lashkar e Taiba, a designated Foreign Terrorist Organization (FTO) by the U.S. government, which has conducted numerous jihadi attacks including the four-day long Mumbai (India) attack of 2008 which killed over 160 people. Pakistan has never been a friend to the United States, because it is a driving force in the global jihad. Pakistan needs to be crushed along with Saudi Arabia and Iran. Let us say, a miracle occurs, and we somehow manage to prohibit – Radical islam. How will that go about? In order to restrict radical islam, we would need to restrict islam itself. And that can not be done in the self-destructive – equal rights, religious freedom, no-discrimination atmosphere of today. And what exactly is radical islam? Has anyone ever precisely defined it? Where does it come from? How is it taught? From where is it taught? The reason why no one has asked, much less answered these questions, is that those in charge of doing so, themselves realize that it is all about islam. So asking these questions, would inevitably lead to the answer – Islam is the problem, and to curb radical islam, it is required to curb islam. And because of the aforementioned mentality of – equal rights, religious freedom, no-discrimination, they know that they would not be able to make it work, and likely end up losing their jobs. What a sad state our civilization is in. We are committing willful civilizational suicide, because of our own mentality. We are slaves to this mentality. We worship our constitution and our laws. We can not bring ourselves up to criticize our constitution and our mentality, just like muslims can not bring themselves up to criticize their quran and their mentality. It is unbelievable that the U.S. government would continue to send taxpayer money to such a corrupt country as Pakistan! Pakistan is NOT an ally. Our government needs to reassess who our enemies are and take action to rid us of the stupidity of giving them money! More power to the President to eliminate any support to those who do the U.S. harm!